for automatic extraction of files and documents metadata capture. This page will guide users, buyers, software partners and affiliates searching information about our MetaData Miner & Catalogue solution. Your comments and opinion are welcome! Thank you for your visit. How to purchase MetaDataMiner Catalogue software licenses? How do I install MetaDataMiner Catalogue Software? How can I partner with Soft Experience? Which Windows Operating Systems are supported? Can I list documents from folders that are in another server domain? Can Catalogue work over any type of connection between two machines? Can MetaDataMiner Catalogue display and extract NTFS file properties? Does MetaDataMiner Catalogue support and extract Macintosh file comment property? Can MetaDataMiner Catalogue list files from a Linux PC using Samba ? Is it possible to launch MetaDataMiner Catalogue from a batch file? Can file properties extraction be set up for scheduling starting at a certain time using an external scheduler? What's new in current version? How to apply the new release? Can MetaDataMiner Catalogue include sub folders in reports? Can I use it for updating Microsoft Office document properties (Word, Excel, etc.) ? Why when I add properties to my JPG and TIFF files via Windows XP explorer, they don't appear in Catalogue properties reports? How to make it work for this? Can MetaDataMiner Catalogue create a directory list filtering by file type or metadata type for example jpeg photos metadata ? Is MetaDataMiner Catalogue interface available in several languages? How to list several folders in one single output report? 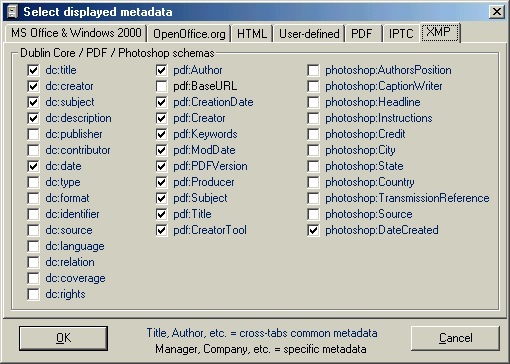 Can MetaDataMiner Catalogue PRO export the XML metadata from one or more PDF documents? How to rapidly produce printed directory list with MetaDataMiner Catalogue PRO ? I need to automatically set a file's properties title field to the filename for all files in a given folder? Can Metadataminer Catalogue do this? How to keep informed about last updates ? We encourage you to first download the demo version and evaluate it before you buy . Catalogue can be registered in "normal" or " Pro " mode. Only "Pro" mode allows to use also console command line for batch processing. We also offer Catalogue Site license - Standard version for unlimited use in all machines of a Company Site = 2500$US. We also provide Corporate licenses to companies whishing to share common way of working at reasonable costs; Request a quotation . A site license entitles an organization to duplicate the software as necessary for use within a site location. A Corporate license offers unlimited use in all sites of the Company. If you don't have a particular company purchase order form you can print Catalogue order form, fill it and send it to Soft Experience with your payment. The setup program will install MetaDataMiner Catalogue in your Windows C:\Program Files directory but you can choose a different one. After installation, configure Catalogue according to your needs; To reach the help, press menu ? + help. You need administrator rights to properly install the different components in particular to register specific DLL provided with the program. Yes, we can evaluate a customization request. Send your request for a quotation emailing us to patrick@softexperience.com . We appreciate partnering with consultants, distributors and resellers offering integrated software solutions or consulting focus on customer satisfaction. If you have a web site, as a webmaster you can apply to our affiliation program , get deserved revenue proposing and selling our software or add a link to our site. Software sites can also include our software information ( Pad format files available Meta ). If you want to improve your knowledge or use of Catalogue Files Metadata Miner feel free to send us any opinion or question you might have and we will add information to this page. Metadata and documentation software Catalogue runs as an application on Windows 95 / 98 / ME / Windows NT4 / Windows 2000 / Windows XP in interactive mode in standard and professional version and also via command-line for batch in PRO version. Yes, Catalogue can access other server domains if it runs using an account that have the permissions to access them. Can MetaDataMiner Catalogue work over any type of connection between two computers? Yes, if from the machine where Catalogue is installed you can reach the folder on the other machine with your Windows Explorer and manually open/copy/move/suppress files between the two computers, then you should have no problems cataloging files information and folders trees with Catalogue. Yes . Catalogue will retrieve NTFS file metadata from Windows 2000 files that are stored on NTFS formatted drives. Yes . You can access and extract comments from Mac files located on Windows NTFS volumes (running on Windows NT 4.0 or Windows 2000) with this document data miner tool. Can MetaDataMiner Catalogue list files from a Linux PC using Samba? Yes, if Catalogue is installed on a Windows PC with access to a Linux PC with Samba. Is it possible to call MetaDataMiner Catalogue from a batch file? Yes if you have Catalogue Files Metadata Miner PRO version for example for batch word document properties summary. Then it will automatically extract files metadata into an XML file using command-line and optionally apply an XSL transformation to build your custom HTML, CSV, or other file result programmed in your XSL transformation. With Catalogue PRO you can easily extract and integrate documents metadata in Content Management Systems. Can MetaDataMiner Catalogue be set up for scheduling starting at a certain time using an external scheduler ? Yes, you need to set up the options to build catalog extractions, before the scheduler runs Catalogue.exe and use command line mode of Catalogue Professional version. Spanish language added, improved XMP custom properties from Adobe PDF documents. A new optional cache function has been implemented to speeder file information retrieval process on large folders. - Support of Adobe XML (eXtensible Metadata Platform) metadata standard for information retrieval. - Command-line mode for inclusion in batch files especially for automated file properties extraction and data transformation. - Standardization of 2 IPTC field names in Photoshop documents metadata retrieval. Download and unzip the last version of MetaDataMiner Catalogue. Run the CatalogueSetup wizard. You can install EXE file only or the full package. It is recommended that you save your registration key before. In interactive way, Catalogue acts as an extended Windows explorer application and you can navigate folder by folder to get a quick directory list of files and their properties (author, subject, category, etc.) Easy index maker for all files including HTML. When you set up the folder list to report as an automatic HTML page, you can select sub folders option for a specific folder or on each folder. Using XML feature it will also extract a directory and all subdirectories: select the parent folder and export information from all its sub folders in an XML format that you can after display in various formats presentation. Can I use it as an update file properties summary software for Word documents and other MS Office files? Yes, Catalogue is able to set a specific value in Microsoft Office files such as Word, Excel, PowerPoint for all files in a directory and optionally subdirectories; it can be a standard property or a user defined file property. It works for example as a Word metadata display utility but also as a mass property update on a set of several documents. You can filter by file type (extension) and apply conditions for update. Why when I add properties to my JPG and TIFF files via Windows XP explorer, they don't appear in Catalogue properties report? How to make it work for this? Jpeg and Tiff images stored on an NTFS volume (Windows NT, 2000 or XP) can have several metadata sets that are different kind of metadata. - Windows properties are accessible via Explorer using right click button and menu Properties. This information is specific to Windows systems. For files other than Office files (Word, Excel, etc.) the properties are not stored inside the file but in NTFS file system objects called streams. So they are not portable : you will loose them when you transfer the image by email or when you move/copy it to another system (Unix, Mac, etc.) or to a FAT volume that does not support streams. - IPTC fields are not accessible directly via Windows Explorer but using a program like for example Adobe PhotoShop or an explorer add-on. To create and update IPTC properties we recommend our Kalimages solution. You will be able to use the IPTC editor to add/modify IPTC field values in particular using customized controlled vocabularies (with hierarchy and synonyms). Because IPTC fields are stored within the image file, they will "navigate" with the file when you send it. This way any user with Photoshop on a Macintosh can also see them. Catalogue lists IPTC fields for images (properties of jpeg files, jpg, tif, tiff files). On Windows systems we recommend to use IPTC metadata for images. Of course for other Windows files Catalogue will list Windows files properties but for images it makes sense to prefer listing IPTC, a standard for who is manipulating graphics. However both Windows and IPTC metadata will be present until files are on NTFS volumes. If you need to transport files with their stream information across the Internet or email you can use Rarissimo software (a WinRar companion add-on) to preserve all information. Can MetaDataMiner Catalogue create a directory list filtering by file type or metadata type? Print : How to rapidly produce printed directory list with MetaDataMiner Catalogue PRO? When navigating in directories, you can list each one as an HTML or Word document - use button HTML or Word and then print it. Yes, the interface is available in English, French, German, Portuguese and Spanish languages. You can easily create a new one. Drop us a line and we will help you on that task extending multilingual support. How to list several folders in one single output report with Catalogue Files Metadata Miner software? 1) Click on "Edit" button and then using "+" and setting options you can add the folders you want in your final report. When adding a folder, specify if you want also the list of its sub-folders. refresh the result each time the content of folders change and you want a new report. This is an interesting feature for project managers to automatically rebuild an up to date index of their shared documentation - setup once, refreshed on demand via a simple click. - add an index in the top of html report automatically and for example check drop down option - it is a nice way to navigate in the html page results. Test the different options in the layout and build HTML for a result display. file); this save the content of "Edit " and layout associated. 4) For more specialized reports, you can go to a folder, use XML button for an output file in xml format containing all information of selected folder and its sub-directories; after that, using the XSL transformations of Catalogue of you own (more technical and programming knowledge) you can customize your outputs. I need to automatically set a file's properties title field to the filename for all files in a given folder. Can Metadataminer tool do this? Yes, using the mass Modify set of files properties function (shortcut F6) with the $filename parameter in Title property for Microsoft Office files such as Word, Excel, Powerpoint. You can also use this functionality to create your own property type i.e. user defined property on a set of documents: name it and optionally set a default value; this way you avoid to add this defined field in documents instead of opening one by one. How to keep informed about the last updates of Metadata Miner Catalogue properties manager software?